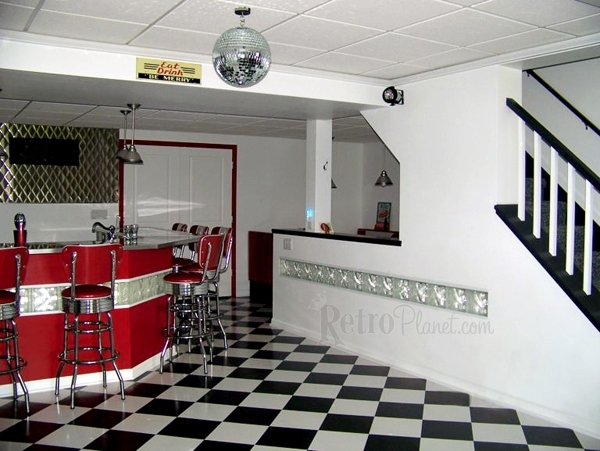 Laura and her family in Clarkston, MI gave their basement a retro makeover and it is fabulous! 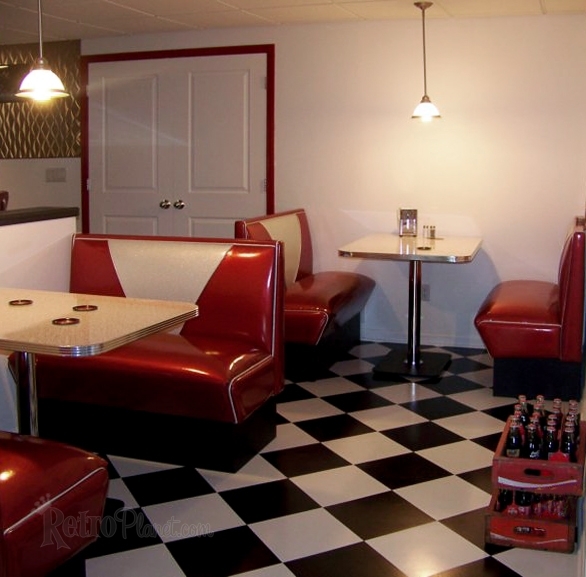 Laura chose the V-Back Diner Booth & Tables for diner-style seating. Laura chose our most popular booth set, the “V-Back”, in Zodiac Burgundy and Silver vinyl with Red Glacier Boomerang laminate tabletops. 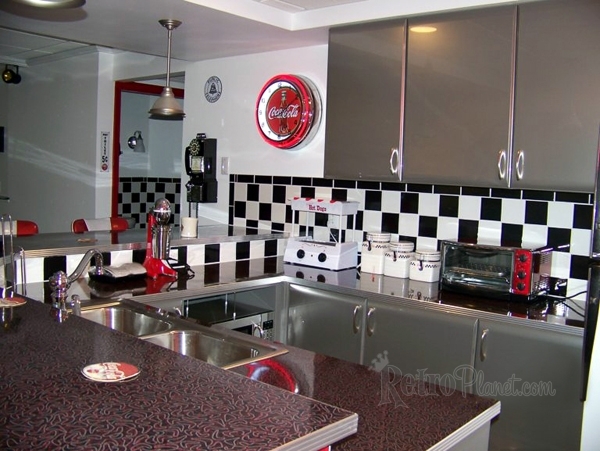 The Black and White tile flooring and retro lighting finishes off her “retro theme”. The bar features V-Back Bar Stools. And what basement-diner wouldn’t be complete without a disco ball? Laura and her family can dance the night away under the Disco Ball, then pull up a seat and take a break in comfort on their V-Back Bar Stools in Zodiac Burgundy and Silver to match their diner booths. Love the glass block inserts! Finishing touches include a vintage-style Coca-Cola clock and black payphone. Laura’s keen sense of style and design sparkle with this fountain service bar. From the vintage style Payphone and Coca-Cola Double Neon Clock to the White Canister Set and Red Toaster Oven, the attention to detail is outstanding. She purchased our Red Ebony Boomerang laminate sheets and grooved aluminum trim to create custom countertops to complete her bar. Red, Black, White and Silver accessories are perfect for keeping with the color scheme.